Is Bronchitis Contagious? How Long is Bronchitis Contagious? 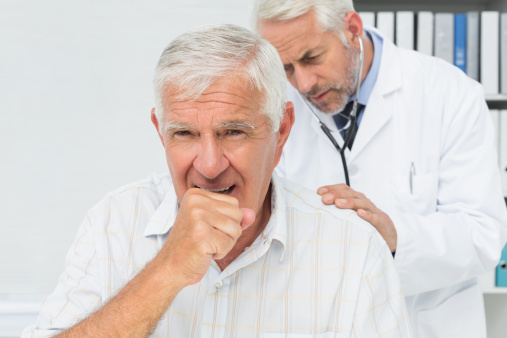 Home » General Health » Is Bronchitis Contagious? How Long Is Bronchitis Contagious For? How Long Is Bronchitis Contagious For? Summer is officially over. In the coming weeks the leaves will begin to change from green to orange, yellow, and red—but the autumn air will also bring cooler weather, warmer jackets, and more trips to the doctor’s office. They don’t call it the common cold for nothing. In fact, it is estimated that there are a whopping 1 billion colds in the U.S. every year. I’m starting to hear—and see—all the usual signs of cold season. For instance, people are beginning to experience fevers, congestion, fatigue, loss of appetite, and sneezing. Some people may even feel a sore “tickle” in their throats accompanied by a cough. However, a cough is not always a sign of the common cold, especially when it is a dry cough. Sometimes it could progress to a chest cold, more commonly known as bronchitis. Bronchitis is a lower respiratory infection where the mucus membrane in the bronchial passages of the lungs becomes inflamed. People with bronchitis have trouble breathing in oxygen and air in the lungs, and heavy amounts of phlegm or mucus will form in the airways. As a result, a cough will occur. The answers to these questions depend on the type of bronchitis one has. There are two types of bronchitis—acute and chronic. Acute bronchitis: Acute bronchitis is considered the infectious bronchitis caused by bacterial or viral infections. In other words, acute bronchitis is contagious. It can last for as little as a few days to three weeks, and will often follow a viral infection like the flu or cold. Acute bronchitis is more severe than an average cold, but not as serious as pneumonia. Chronic bronchitis: Chronic bronchitis is considered quite different from acute bronchitis. It is a long-term lung disorder and a form of chronic obstructive pulmonary disease (COPD) that also sometimes occurs with the other type called emphysema. A person with chronic bronchitis often experiences a cough with mucus during most days in a month. This sequence will usually occur for a period of three months in a year, for a minimum of two consecutive years. Besides coughing, the other signs and symptoms related to acute and chronic bronchitis include wheezing, chest tightness, body aches, breathlessness, headaches, a blocked nose and sinuses, a sore throat, and a low fever with chills. What will cause acute or chronic bronchitis? Lung irritants or infections are the likely cause of acute bronchitis. Smoking tobacco may also worsen bronchitis symptoms; however, when smoking is considered a potential cause of acute bronchitis, the condition is not considered contagious. It is also not contagious when the person is exposed to air pollution and other environmental factors like dust, fumes, vapors, or pollen. Bacterial agents can also cause acute bronchitis, including mycoplasma, bordetella, moraxella, streptococcus, haemophilus, and chlamydia pneumoniae. Chronic bronchitis will develop from continuous inflammation and irritation of your air and lung passages over several years. Cigarette smoking is thought to be the main cause of chronic bronchitis, but the condition can also result from environmental factors, such as fumes, dust, or air pollution. Bacterial and viral infections that cause acute bronchitis can progress to chronic bronchitis when repeatedly exposed to infectious agents. On occasion, chronic bronchitis can also be caused by underlying disease processes such as cystic fibrosis, asthma, congestive heart failure, immunodeficiency, acquired or congenital dilation of the bronchioles, or familial genetic predisposition to bronchitis. It may be difficult to know whether you have bronchitis or the common cold after being sick for only a few days. But, when your coughing continues long after your other symptoms end, you may have bronchitis. How long is viral bronchitis contagious for? That often depends on the virus that caused your bronchitis. Since your doctor doesn’t test for an individual virus, it could be one of hundreds of infectious viruses. You will often become contagious for at least three days, or as long as a week. It is best to stay home whenever you show signs of bronchitis, and assume you could spread the disease. The best medicine for treating bronchitis is rest and relaxation. Most of the time acute bronchitis does not require treatment. It is a good idea to take time off work to fully recover, while drinking plenty of water and herbal teas. Others may decide to manage symptoms with over-the-counter cough suppressants or expectorants, and pain relievers like acetaminophen. Antitussives (drugs that suppress coughing) are also used when the cough interferes with sleep. An inhaled beta-agonist or anticholinergic drug may also be given when a person experiences wheezing. For chronic and acute bronchitis, bronchodilators are also used to expand the inner airways and steroids will also reduce inflammation. Other conventional methods for bronchitis include mucolytics, oxygen therapy, and pulmonary rehabilitation with a respiratory therapist. Some doctors may still prescribe antibiotics for acute bronchitis; however, they are almost never useful for the condition, and they can even cause difficulty breathing, and swelling of the throat, tongue, lips, and face. There are also a variety of natural treatments that help relieve the symptoms related to bronchitis. The following are a few natural remedies that you can try at home. Lobelia is considered the most effective herbal expectorant for clearing the lungs. Other herbal remedies used for bronchitis include ivy, wild cherry bark, South African geranium, and licorice. Guaifenesin is an isolate from beech wood that is an over-the-counter mucolytic and expectorant that helps thin mucous secretions related to bronchitis. Honey is considered an effective antibacterial and antiviral remedy that helps soothe the throat, reduce inflammation, and build the immune system. In a 2007 study published in the journal Archives of Pediatrics & Adolescent Medicine, buckwheat honey was considered more effective at relieving coughs than the cough suppressant dextromethorphan. To help with your bronchitis, simply add a teaspoon of honey to your herbal tea each day. Homeopathy is also considered effective for upper respiratory tract infections and acute bronchitis. In a 2014 study published in the journal Pulmonary Pharmacology & Therapeutics, researchers concluded that homeopathic syrup could effectively reduce mucus viscosity and cough severity in the management of acute bronchitis induced by upper respiratory tract infections. Homeopathic remedies known to be useful for bronchitis include bryonia, belladonna, causticum, phosphorus, aconite, rumex crispus, spongia tosta, mercurius, antimonium tartaricum, sulphur, carbo vegetabilis, and sticta pulmonaria. Breathing exercises can also help relieve bronchitis symptoms. For example, a pursed-lip exercise can help improve the airflow to your lungs. Diaphragmatic breathing can also help improve breathing. Other natural remedies for bronchitis and sore throats include eucalyptus oil, ginger, gargling salt water, an Epsom salt bath, onions, sesame seeds, oregano oil, cayenne pepper, garlic, lemon, thyme, bay leaf, spinach, savory, holy basil, Malabar nut, mullein, and plantain. Particular nutrients used to treat acute and chronic lung conditions include N-acetylcysteine, bromelain, vitamin A, and vitamin C.
Venkatesan, N., et al., “Protection from acute and chronic lung diseases by curcumin,” Advances in Experimental Medicine and Biology, 2007; 595: 379-405. “Homeopathy for Bronchitis,” Hpathy web site, January 29, 2014; http://treatment.hpathy.com/homeo-medicine/homeopathy-bronchitis/. Sethi, S., “Acute Bronchitis,” Merck Manual Profession Version web site; http://www.merckmanuals.com/professional/pulmonary-disorders/acute-bronchitis/acute-bronchitis, last accessed September 23, 2015.